Jewish and Muslim organisations have staged a joint protest in the German capital Berlin over a regional court's ruling that the circumcision of young boys constituted bodily harm. 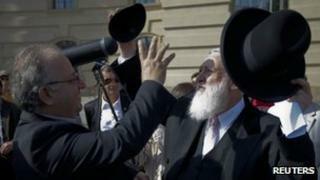 The protest was prompted by the news that a rabbi in Bavaria was being investigated over the practice. The ruling on circumcision was handed down by a court in Cologne in June. However, the German government has since announced it will legislate to explicitly legalise the practice. About a thousand people joined the protest to hear speeches from the chief rabbi of Berlin and other religious leaders. "I'm here to stand for the freedom of religious rights," protester Fereshta Ludin told the BBC. The court in Cologne had declared that the ritual circumcision of a Muslim boy, in accordance with his parents' faith, had caused the child bodily harm. The German Medical Association then told doctors across the country to stop performing the procedure. Both Jews and Muslims feel that, whatever the court intended, the ruling will be used as a way of attacking their religions, the BBC's Stephen Evans in Berlin reports. On Wednesday, the state government in Berlin announced that circumcision was legal there, as long as it was properly carried out. The federal government, perhaps in response to international condemnation, has also said it wants to legalise the procedure explicitly, our correspondent adds. There has also been renewed debate over the practice in the US, one of the countries where it is most prevalent. Last month, the American Academy of Pediatrics (AAP) published a review of scientific evidence on the circumcision, saying that "the health benefits of newborn male circumcision outweigh the risks of the procedure". However, the AAP added it did not recommend it for all newborn boys, saying the decision was best left to parents, in consultation with doctors. A parent's right to choose?